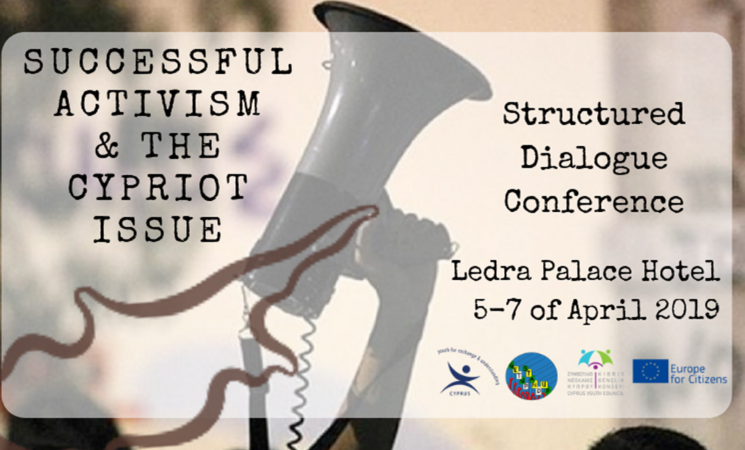 YEU Cyprus, with the support of the Youth Council of Cyprus, is organizing a three-days Structured Dialogue conference on the topic of successful activism in the field of the Cyprus Issue and not only! This conference aims to bring 30 youth together with the aim to motivate them to participate in the decision making process on political level during the discussions on the Cypriot problem and promote successful ways of activism through existing and previous examples. To raise awareness on how previous European movement can contribute to the Cypriot problem. Non-formal methodologies will be used to reach the objectives of the programme. By the end of the conference, we aim to come up with recommendations on how youth can be more motivated and engaged in the decision making process regarding the Cyprus issue. The participation on the programme is for free and it will provide coffee breaks and two meals for Saturday and Sunday. We can provide accommodation or traveling budget upon request for participants who are coming from other cities of Cyprus. The project is funded by Europe for Citizens and it is under the scope of the long term project #GetUpStandUp which surrounds itself with influential European protests in order to raise awareness of their significance, use them as examples to stimulate debate and finally utilize them as means of reflection and comparison on their nature and their influence on our society and contemporary protests as well. YEU Cyprus is organizing a Structured Dialogue Event about "Gender Equality in Cyprus". If you would like to discuss about this topic and share your ideas with other youth (13 - 30 years old) then you have the chance to do it at our event! When it comes to gender equality, Cyprus is at the bottom of all EU countries bar one, with only Malta ranked lower. What do you think are the main reason for gender inequality in Cyprus and what are its consequences in everyday life? What can be done to promote more equality both on the political, working and family environment? Participants will receive a Participation Certificate. - Presentation of the topic by Dr Evelina Leivada, specialist scientist - teaching fellow at the Department of Rehabilitation Sciences at Cyprus University of Technology and at the Department of English Studies at University of Cyprus. 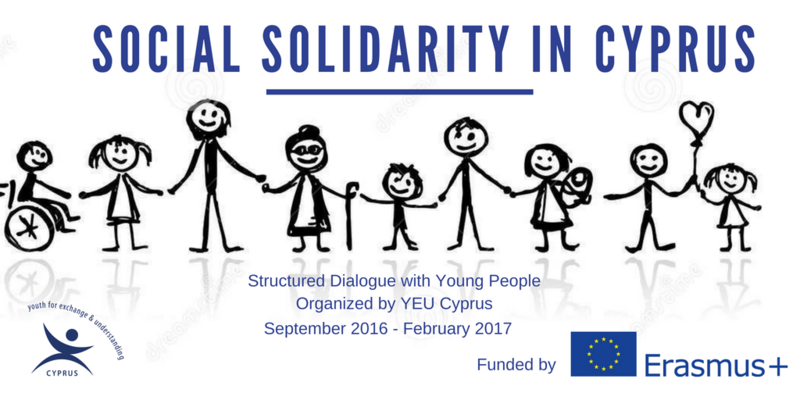 The project “Social Solidarity in Cyprus” is funded by the Erasmus+ programme of the EU under Key Action 3 (Support for policy reform - Structured Dialogue) and it is organized by Youth for Exchange and Understanding Cyprus. The project will be released on 1st of September and it will last until end February 2017. The aim of “Social Solidarity in Cyprus” is to hear the views of youth in social inclusion and racism issues in Cyprus and to urge young people to learn and discuss with policy makers about these issues themselves. Opportunity will be given to Greek Cypriots, Turkish Cypriots, Armenians, Maronites, Latins, but also to social groups often suffering discrimination as women, homosexuals, disabled or foreigners (i.e. recognized refugees or immigrants) living permanently in Cyprus, to discuss and express how they envision an ideal society and how this can be done. In the same time, the project will give youth the opportunity to sit with various policy makers and to address all this aspects. One of the most important actions of the project it is a three-day Conference between 25th -27th of November 2016 designed to equip participants with knowledge about Structured Dialogue and about how these issues can be solved. 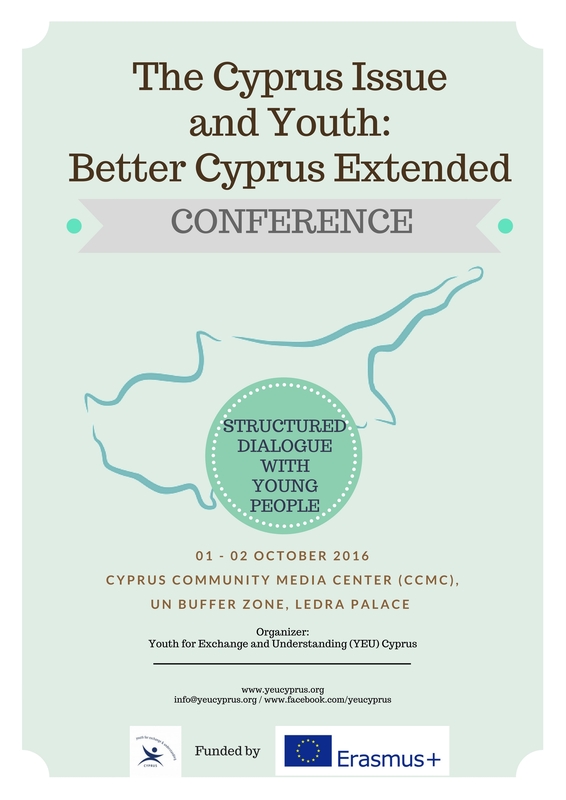 Speakers, policy makers and participants will exchange views and suggest ways in which they can confront issues in Cyprus from this topic. Later on, the project will involve the release of an electronic questionnaire with the aim of collecting a large number of opinions which will be include in a policy paper produced in order to be forwarded to all relevant bodies both in Cyprus (eg in the House of Representative and / or the Ombudsman, the Commissioner for Human Rights, etc.) and abroad. The project “Better Cyprus Extended” is funded by the Erasmus+ programme of the EU under Key Action 3 (Support for policy reform- Structured Dialogue) and it is led by Youth for Exchange and Understanding (YEU) Cyprus. The aim of this project is to record the views of all young people, from all the groups and communities in Cyprus, with regards to the Cyprus issue. 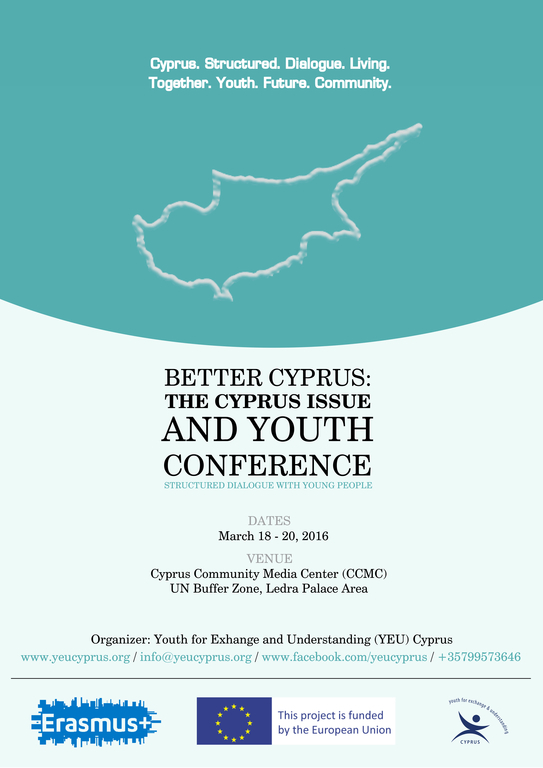 A first part of the project called “Better Cyprus” was released on the 1st of February and led to policy recommendations for a better Cyprus led by young people. The second part of the project, “Better Cyprus Extended”, was released on the 1st of September. It is designed to reach more young people from all the communities in Cyprus and to reach in deep results on the Cyprus issue. An important action of the project is a two – day conference that will take place on 1 - 2 October in Nicosia, with the purpose of bringing together more speakers, participants and policy makers for exploring potential recommendations for a better Cyprus. Registrations are now open and are available here. The importance and need of such an event is evident after the recent developments. After the programme the organization intends to present the findings and to share the results with the leaders of the two communities. Negotiations about Cyprus Issue go on for decades, while lately there is clearly a lot of effort been put in order to achieve a solution. Yet, the ones who will actually live the solution in the island, the young people, are never considered as stakeholders or been asked about their opinion. This approach goes against the recent UN Resolution on Youth, Peace and Security which actually recognizes the significant role young people can play in achieving peace and security. The resolution also responds to the limited opportunities for youth to participate in formal peace processes by encouraging the inclusion of youth in peace negotiations and peacebuilding efforts. Taking these into consideration, the non-governmental organization Youth for Exchange and Understanding developed the project “Better Cyprus: The Cyprus Issue and Youth”. The aim of the project is to record the views of all young people, from all the groups and communities in Cyprus, with regards to the Cyprus issue. It intends to engage young people into a dialogue about the Cyprus Issue and empower them to envision the Cyprus they want. The project will use the methodology of structured dialogue, a process which uses a bottom-up approach, gathering the opinion of grassroots and through various steps produces policy papers with recommendations that need to be adopted by stakeholders. Online questionnaire: The online questionnaire will aim to gather the opinion of 500 young people all over the island on the Cyprus Issue. The questionnaire is developed on the recommendations gathered by the 2 focus groups, allowing of course the respondents to provide their own opinion too. Conference: The main action of the project is a three – days Conference that will take place on 18 – 20 March at the CCMC premises close to Ledra Palace, in the UN Buffer Zone, in Nicosia.During the Conference, the outcomes of the focus group and the questionnaire will be presented and further discussed, aiming to gather a more comprehensive opinion from young people and more concrete recommendations. The conference will gather 50 young people from all communities living in Cyprus (Greek Cypriots, Turkish Cypriots, Greeks, Turks, Armenians, Maronites, as well as other cultures established in the island). It must be noted that the Conference will host reputable speakers and policy makers who are distinguished connoisseurs of the subject, among them Ms Poly Ioannou, Director at the office of the Greek-Cypriot Negotiator; and Dr. Niyazi Kizilyurek, Professor at the University of Cyprus. The project will led to a policy paper with a set of recommendations to be shared with the leaders of the two main communities in the island. The aim is to advocate for addressing and incorporating the recommendations of young people in the peace building efforts that are currently taking place. The project is funded by the Erasmus+ programme of the EU under Key Action 3 (Support for policy reform- Structured Dialogue) and it was launched on 1st February 2016 by YEU Cyprus.